Sale-A-Bration is here! I know I am a bit late in posting this but I have been busy and have not had a chance till now. 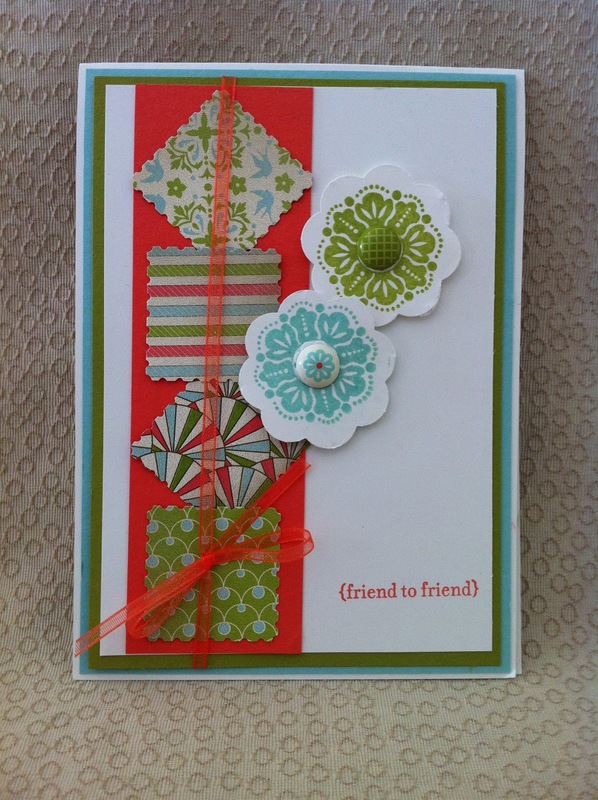 Over the next few weeks I will be adding more Sale-a-Bration cards and ideas using each stamp set. Today I have mainly focused on the Fresh Vintage stamp set. I must say the Sale-A-Bration items are really pretty this year. I love the DSP and brads. Fresh Vintage does have a real vintage theme but as you can see you can do some modern looks with it. Postage Stamp and Fresh Vintage - inspired by Dawn Olchefske. 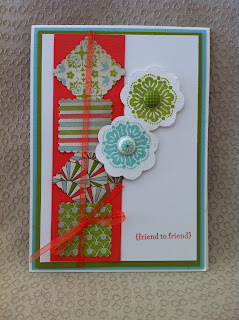 Gift Tag made from scraps - Postage Stamp punch and Everyday Enchantment DSP. Ink: Pool Party, Soft Suede, Calypso Coral, Lucky Limeade. Cool Tools: Small Heart Punch, Heart To Heart Punch, Postage Stamp Punch, Bouquet Triple Layer Punch, Itty Bitty Punches, Sponge dauber, Everyday Enchantment Brads (Sale-A-Bration).